Violinist Holly Mulcahy is a person who approaches every facet of her life with intention and sincerity. 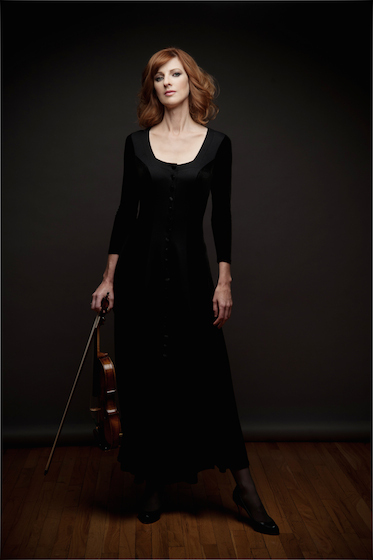 Now in her second season as concertmaster of the Chattanooga Symphony, Ms. Mulcahy is acting in truly interesting ways to engage both her musical colleagues and her musical community. “I’m grateful to be in a position where I can connect people, and when I took this position I did it with the intention of being a true and human presence in my community,” she said in a telephone conversation. Ms. Mulcahy’s dynamism and desire to connect is also reflected in NeoClassical, a blog in which she shares thoughts about her new community and its openness to new works and people, the classical music industry, and her own sense of adventure – that leading to her inspiring a Chattanooga bartender to create a cocktail named "The Awakening" in honor of Jennifer Higdon’s Violin Concerto, which Holly will perform with the Chattanooga Symphony on March 12, 2015. This adventuresome spirit is the perfect one with which performers and audiences can experience Jennifer Higdon’s captivating concerto, which was written for and premiered by violinist Hilary Hahn. Written in three movements (“1726”, “Chaconni”, and” Fly Forward”), this Pulitzer Prize-winning concerto is also the ideal vehicle with which Ms. Mulcahy continues to integrate her desire to help a community continue embracing itself. Indeed, Ms. Higdon has become an incredibly well-recognized force in the music industry. Her "blue cathedral," a two-movement sonic adventure for orchestra, has become one of America’s most performed contemporary orchestral works, with more than 500 performances worldwide since its premiere in 2000. The Violin Concerto, however, since being premiered by Hilary Hahn, is currently only in the repertoire of four contemporary violinists, those being Ms. Hahn, recent Montreal International Competition winner Benjamin Beilman, Naha Greenholtz (concertmaster of the Quad-Cities Symphony) - and Holly Mulcahy. Violinist Holly Mulcahy performs Jennifer Higdon's Violin Concerto with the Chattanooga Symphony on Thursday, March 12, 2015. For more information on Ms. Mulcahy, please visit www.hollymulcahy.com. For more on Ms. Higdon, please visit www.jenniferhigdon.com. I miss my hometown. It has changed so much over the past 30 years. The rejuvenation in the downtown/river park area has been amazing and brought a new life to the city. I remember when downtown was a place you DID NOT go to unless you had to. Now it is the soul of the city again. I'll have to go the symphony next time I'm in town. Last time I went was sometime in 1980-something.